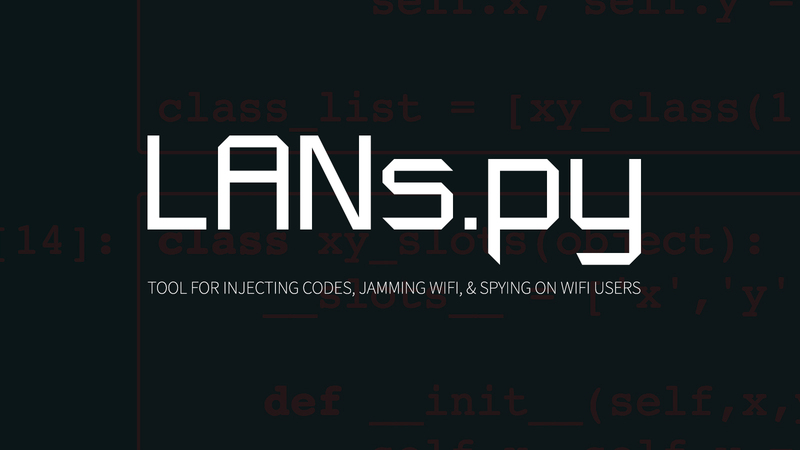 LANs.py is a multithreaded asynchronous packet parsing/injecting ARP spoofer. It can automatically find the most active WLAN users then spy on one of them and/or inject arbitrary HTML/JS into pages they visit. The script individually poisons the ARP tables of the target box, the router and the DNS server if necessary (Does not poison anyone else on the network). It also cleans up after itself. It can also be used to continuously jam nearby WiFi networks. This has an approximate range of a 1 block radius, but this can vary based off of the strength of your WiFi card. This can be fine-tuned to allow jamming of everyone or even just one client (cannot jam WiFi and spy simultaneously). A wireless card capable of promiscuous mode if you don't know the IP of your target. It supports interception and harvesting of data from the following protocols: HTTP, FTP, IMAP, POP3, IRC. It will print the first 135 characters of URLs visited and ignore URLs ending in .jpg, .jpeg, .gif, .css, .ico, .js, .svg, and .woff. It will also print all protocol username/passwords entered, searches made on any site, emails sent/received, and IRC messages sent/received. -m MAXIMUM: Maximum number of clients to deauth. Use if moving around so as to prevent deauthing client/AP pairs outside of current range. --packets NUMBER: Number of packets to send in each deauth burst. Default is 1 packet. --accesspoint ROUTER_MAC: Enter the MAC address of a specific AP to target. This script uses a python nfqueue-bindings queue wrapped in a Twisted IReadDescriptor to feed packets to callback functions. nfqueue-bindings is used to drop and forward certain packets. Python's scapy library does the work to parse and inject packets. Injecting code undetected is a dicey game, if a minor thing goes wrong or the server the victim is requesting data from performs things in unique or rare way then the user won't be able to open the page they're trying to view and they'll know something's up. This script is designed to forward packets if anything fails so during usage you may see lots of "[!] Injected packet for www.domain.com" but only see one or two domains on the BEeF panel that the browser is hooked on. This is OK. If they don't get hooked on the first page just wait for them to browse a few other pages. The goal is to be unnoticeable.